Today I want to share with you a pack of crisps! This being an Italian pack of crisps though, don’t expect it to be anything but special! 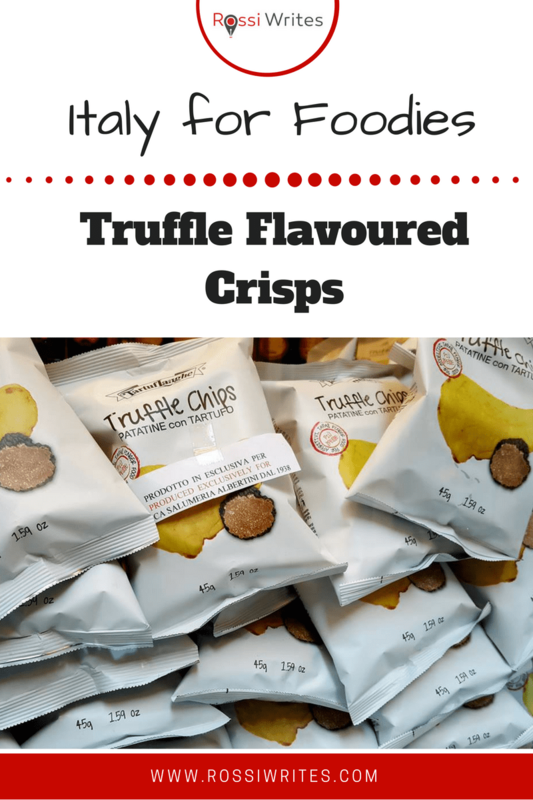 Instead of such slightly less refined flavours as ‘cheese and onion’ and ‘salt & vinegar’, these crisps are flavoured with truffles. Yes, real black truffles. The type which used to be hunted with hogs before the task was given to dogs as they (unlike the pigs) wouldn’t eat the prized truffles upon finding them. I spotted these very special truffle crisps (or chips, as they are known in Australia and America) in the window display of a cute little deli called Antica Salumeria G. Albertini in fair Verona. Obviously, I had to have a pack (culinary research and all that). In all honesty, I gasped a bit at their price of 2.50 euros for a pack of less than 50 gr, but you pay for quality, right? have been produced exclusively for this little deli since 1938! Pedigree crisps? Yum! I kept the pack for a few days, as I sort of thought that we needed a special occasion or something to sample the crisps. Eventually, I got tired of the pack sitting on top of my tiny kitchen counter clogging up space, so I tore it open and put the crisps in a bowl which I served with whatever un-remarkable dinner I had cooked that night. The crisps tasted good. Very truffle-y, for a lack of a better description. At first, the flavour felt a bit strange, alien even, but it quickly grew on me. I am telling you, I can definitely get used to the high life, truffles et al. Now, what’s your favourite crisp flavour? Let me know.